Don’t get us wrong. Summer is great, and Zuzi is a strong proponent of the idea that the monthly average temperature in Prague should be around 25C/78F all year round. But when it gets really hot, the high temperatures make it really hard to enjoy one of our primary passions and the fuel we need to get us going: coffee. Luckily, Prague cafes have been working hard to resolve the issue and are offering some interesting summer coffee specials. Virtually every specialty coffee venue offers cold drips, cold brews, iced filters and espressos, and we love ‘em. (Zuzi can’t seem to go through a single day without the shaken iced Aeropress at EMA Espresso Bar.) The baristas are putting their own spin on iced coffee, finding the perfect beans and the perfect method to find a great balance of aroma and flavor, and you can talk about it for hours. Some cafes also offer bona fide signature drinks that will get you cool, caffeinated, and sometimes a bit buzzed. And we like all these three things in the summer. The spanking-brand-new cafe by the Doubleshot roasters in the Bubenec district (which, coincidentally, is where we live, so hooray for us) has brought the A-game to the Prague iced-coffee game. We’ve always wondered why the baristas who compete in various barista championships around the world never sell their winning competition drinks in their home cafes. Well, Misto has probably planted a chip in our head (or they just did the logical thing, one or the other) and offers Rosemary, Ondrej Hurtik’s signature drink that secured him the 2nd place in the Coffee in Good Spirits world champs in Gothenburg, Sweden. In addition, they also offer delicious iced Irish Coffee (but more about that later) and the classic espresso and tonic. After you had your morning fix (this can mean many things, since Rosemary includes OMG gin by the Zufanek distillery and vermouth), it’s time to take the tram from the Hradcanska stop to the Letna district. We start in the Cukrarna Alchymista cafe in the Letna district (a district worth exploring with or without coffee). It is a pure student hangout in an eclectic setting reminiscent of old times past, and their outdoor seating in the Japanese-inspired garden in the back is one of the most beautiful places to have coffee in Prague. Their choice of summer coffee drinks does not disappoint, and you can choose from several. We chose the cherry coffee, which is basically cold French press coffee with sour cherry syrup and ice… and it was not bad at all. Somewhat reminiscent of the old Czech Slavia hard candy with hints of Cherry Coke. The perfect drink for a hot, lazy Sunday afternoon in the shade of the trees in the backyard. Unless somebody at the next table smokes like twenty cigarettes an hour, which is exactly what happened on our visit. Oh well. After you’ve finished your coffee, take the number 8 tram to the Karlin district. By the time you’ll get there, you will have built an appetite for another cup of coffee. The Karlin-based flagship of the Doubleshot coffee roasters is the ideal place for regular coffee in the summer thanks to their seating outside under the leafy trees of the Krizikova street. However, they also offer some pretty cool cold coffee drinks. The last of them, probably developed in their barista centre by the 2015 Coffee in Good Spirits runner-up Ondrej Hurtik (we offered to be the guinea pigs for that drink, to no avail), is the iced Irish coffee, which is wonderfully balanced… and actually pretty boozy. Added bonus: you need a spoon to wipe off the cream, which is fun, especially after you’ve had two of these. Their “Bulletproof Shake”, which consists of a shot of espresso, banana, milk and coconut oil, and which seems like something Rocky Balboa would drink in the morning (just add egg) is another popular option. Let’s see what the new cafe of the Doubleshot roasters, Misto in Prague 6, has to offer when it opens this Saturday. But now it’s to take the streets of the Karlin district back to the centre. Stop on the way in the diminutive Kafe Karlin, run by the people behind the Kavovy Klub who have been providing crucial coffee fixes to the visitors of Prague’s farmers’ markets. They offer four cold drinks: espresso on ice, iced coffee, iced latte, and the king of the summer coffee scene: the Red Eye, a cup of filter coffee, a shot of espresso and ice. That should wake anybody up. Continue on into the centre. You can walk or take the number 3 tram. Ahh, EMA Espresso Bar. We get some of our mail delivered there, just in case you were wondering whether we like that place. They offer three summer drinks, which spell EMA together (it’s kinda their thing): “Emil” is espresso tonic with cherry syrup, “Mathilda” is a double shot of espresso with salty caramel, milk foam and pink salt, and “Alfred” is mango shakerato. 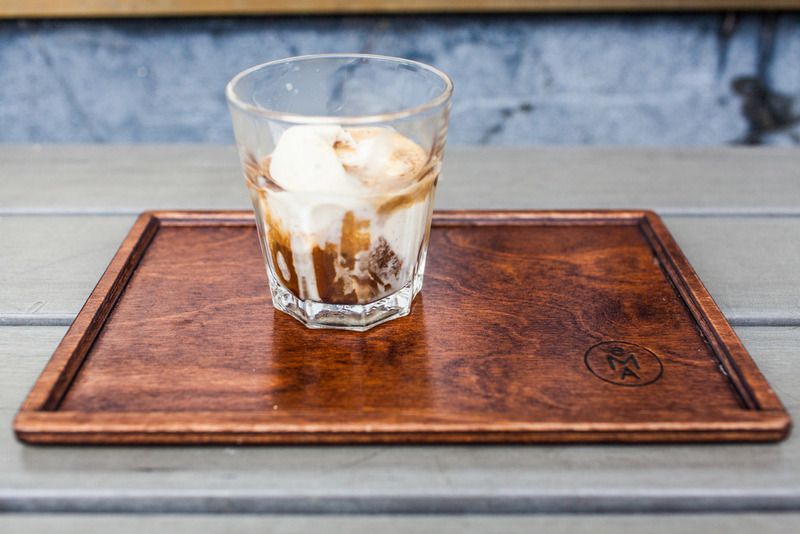 But we still go there to have their affogato, our favorite summer treat: a shot of espresso and a scoop of ice-cream in a small glass. And EMA Espresso Bar sells ice-creams by 2AD, arguably one of the best ice-creams in Prague, so if you combine that with their great coffee, you have a winner on your hands (and sometimes shirt, but that’s another matter altogether.) We had theirs with the vanilla ice-cream. And having that at the bench in front of the cafe (because sitting inside can be frankly quite unbearable on a hot day) is what summer is all about for us. Take the subway to I.P. Pavlova to continue in your coffee journey. We love visiting AnonymouS Coffee. Sure, you can stop in the nearby Kavarna Prazirna for an iced flat white, which might be delicious, but frankly a bit boring. Anonymous Coffee may not be the most serious cafe in Prague, but why would it need to? The three owners are passionate about coffee, but they also have fun and try new things just to see if it will work. And the same applies to their summer offerings: their affogato is actually served with a blueberry-sour cream gelato by Puro Gelato. Zuzi really liked the gelato in the recent Street Food Festival and it actually goes well with the coffee. The vanilla paper with the logo of the cafe is edible (but let’s be honest here: the paper alone is not something you will be craving in your dreams for weeks to come). Their Bohemian Sun Shield adds Becherovka Cordial to the mix and is a nod to the cafe’s sister establishment, Anonymous Bar, just as the use of cocktail bitters in their summer coffee drinks. And we’re sure they will have something new the next time we’re there. Have a drink of water and continue into the Vinohrady district past the Namesti miru square into the Slezska street. The cafe and the roasting centre of La Boheme, Prague-based roasters, has created a loyal following among its fans due to the eclectic interiors and solid coffee, the former partly due to the fact they took over a former designer furniture showroom, the latter due to the fact they have they roast their own beans. Their menu has actually quite a few cold drinks, like the tropical espresso with mango flavors, or the lavender iced coffee with almond oil. They also have three alcoholic coffee drinks, like the Espresso Martini. Hurray! We’ve tried the Kavarange, which is drip coffee with green banana syrup and orange juice. It was actually pretty refreshing, if a little on the sweet side. The cafe is a nice place to be in if you like to sit in a comfy sofa or a lounge chair. The only complaint we have is the 30-minute wifi password that has to be renewed every half hour but hey - we are getting spoiled here. It still beats EMA’s no-wifi approach. Walking up into the Vinohrady district, you will reach the last stop of our little city tour. Coffee Room has been very active, constantly improving its offerings, and it is not lagging behind when it comes to cold drinks, either. We had their espresso tonic and liked it, even if it was a bit sweet for our taste. They told us they were planning to use Fentimans instead of Schweppes in the future, which should make this better. We’ll see. Their Vietnamese-style iced espresso looked nice, too. And of course, they do offer a plethora of iced coffees, which is something you will need while exploring the Vrsovice district. Just have the last coffee of the day, and then venture off to the Grebovka to have a glass of… wine. Finally!!! Finally, a tip for Saturday morning, and a thing very close to our hearts. The BrewBar at the Naplavka farmers’ market is the place we meet with our friends every single Saturday. And for good reason. Jirka, who will now be working double duty at Doubleshot’s new location Kavarna Misto in Dejvice (oh boy, we can’t wait for that one), is really passionate about drip coffee, and the passion shows. Week after week, he keeps introducing new kinds of coffee to the coffee-drinking public, us included. And it does not stop at coffee. His Cascara Aperol fizz is a drink many can’t imagine their Saturdays without. Just make sure you are there early: they can run out of it very quickly. Breaking news: Adam of EMA in World Barista Champs Semis!